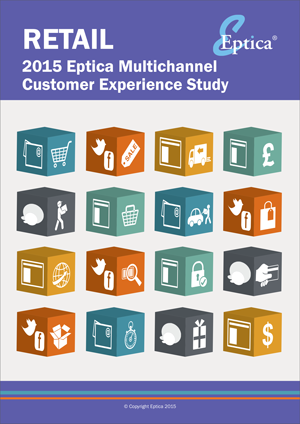 2015 Retail Multichannel Study | Eptica - Multi Channel Customer Interaction Software. Email Management. Web Self-service. Live Chat and Agent Knowledgebase. Over the past five years the Eptica Multichannel Customer Experience Study has charted how retailers have evolved to meet these challenges in 2015. It evaluates leading brands on their ability to provide answers to ten routine questions via the web as well as their speed and accuracy when responding to email, Twitter and web chat. Overall, the Study found that despite significant investment UK retailers are not meeting customer needs online. They can only successfully answer just over half (55%) of all questions asked, and key channels have dramatically worsened since 2014. It took 8 hours longer to receive an answer via email in 2015, compared to last year, with an average time of nearly 44 hours. Despite the UK climbing out of recession, pressure on the retail sector is actually increasing. Shoppers are still price sensitive, driving greater competition as newer, more agile entrants undercut traditional leaders in many parts of the industry. Consumers are continually demanding more – better prices, better service and a better experience. Retailers that cannot offer this across every channel risk losing out to those that are able to understand and meet customer needs. The headline findings masked major differences between companies, sectors and channels – some retailers are excelling, while others are falling further behind. This guide therefore provides more information on the results of the Study, along with areas to address in order to improve the experience moving forward. We invite you to download your copy of the study which includes the full findings of how the Retail sector performed, along with recommendations to improve and address the key challenges of customer experience.